Not long ago, someone I love declared him/herself an atheist, after presumably having been a Christian from the get-go. This got me to thinking about the problems this person has with organized religion, which I’ve noticed is often interchangeable with all forms of Christianity, and is generally held in very low esteem. This person’s declaration brought back to mind doubts I have had over the long haul, not so much whether or not God exists, but how involved He actually is in our lives. One of the big problems people have with God is the idea that there is some meaning behind pain, especially pain visited on seemingly undeserving people, and especially children. I was playing with my ipad the other night and I was searching for CS Lewis’ The Problem of Pain. You can see my search results above. 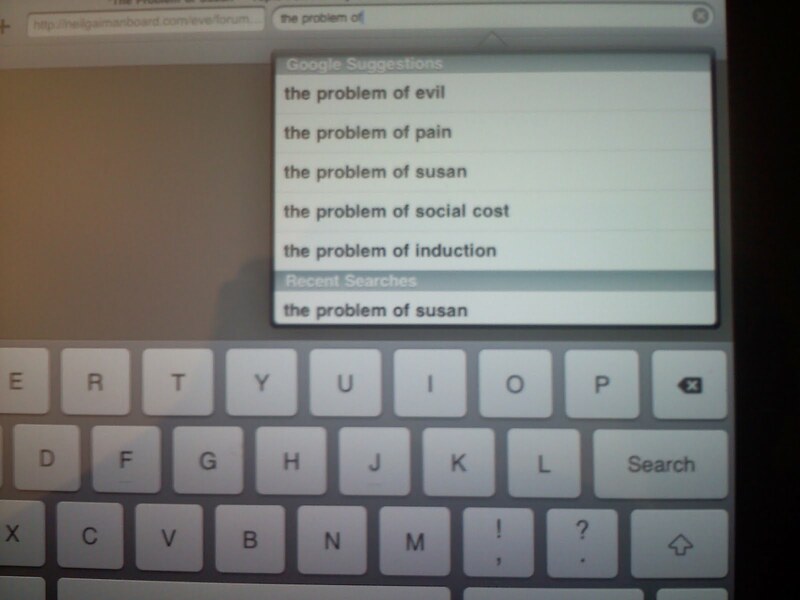 The Problem of Susan? I wondered what that could mean and discovered it refers to the fact that Susan Pevensie (of the Chronicles of Narnia) did not go to Narnia with her brothers and sister. I remember when Greg was reading these books aloud to the kids — I had never read the Chronicles before — and I loved the story and was terribly dismayed that the Susan character didn’t get to be with Aslan. I was seriously bummed. OK, so there’s no connection between Susan Pevensie and me, but I felt disappointed that she didn’t get to go to Narnia. Why would she have been excluded? The Problem of Susan is an essay written by someone who is trying to explain what may have happened to Susan after the train crashed and her family was killed. I haven’t read the essay and don’t know that I need to. It’s not really important what the author thought happened to Susan afterward. I thought it was more important to note the reason she didn’t go to Narnia — she no longer believed, and acted as though it had all been a dream or a fantasy. But when she and Peter were king and queen of Narnia, Aslan said “Once a king in Narnia, always a king in Narnia.” Apparently in the film adaptation, they added the words “or queen,” and I’m ok with believing that Lewis meant king OR queen. No one knows what would have happened to Susan after her family was killed. No one knows what choices she would have made the rest of her life, and no one can presume to know. But let’s say she still had a life to live, that she lived it, and that she had to make a choice at some point (a la The Great Divorce) whether or not to spend eternity with God. I love the idea that she had more of a life to live, experiencing the love and pursuit of God. I’m not a deep thinker. I can’t make connections across disciplines and quote song lyrics and books to demonstrate whatever salient point I am trying to make. But I do understand that relationships are fluid, and that love bears all things, believes all things, hopes all things, and endures all things. So, Aslan didn’t force Susan to come to Narnia when she had stepped into disbelief, but I think neither did he write her off, and that if the story had continued, there would have been ample evidence of his continued love for her. I think I’m kind of like Susan in that way. When I experience God in a relational manner, it’s easy to understand He exists and cares for me. When I stand aside and judge His motives, it’s hard to understand that He could be anything other than evil. I think Aslan would be glad to have me as a queen in Narnia, but he wouldn’t force me. That seems to be a central truth of Christianity — God loves us, and He loved us before the foundation of the world. Atheists, feel free to ask me hard questions about what I’m saying, but I’m not sure I’ll have any answers that would be considered evidence in a court of law. As a matter of fact, I may even believe some unbiblical things — for instance, I believe deeply that each person will get a choice after they die whether or not they want to live with God forever. It won’t be a trick questions. There won’t be anything other than an honest option offered, but I think there will be people who choose NOT to spend eternity with God because of all the choices they made throughout life to turn away from him. They will have convinced themselves that they’d be better off without God. I think CS Lewis’ book The Great Divorce influenced my thinking here. I can’t quote chapter and verse that says this, and some of my readers may be able to quote chapter and verse that says the opposite of this. And there you have today’s thoughts. Wish they could be more decisive! strong! clear! But they are what they are. Thanks for reading! In Eph 6 Paul tells us to put the whole armor of God to withstand the attacks of the enemy. It is important to note that the armor starts and revolves around the belt of truth. The sword hangs on the belt, the shield also hangs on the belt. If our belt is not based in truth then the other implements are of little use. It is very hard to remain a vibrant fruit bearer, especially living in America where we are daily bombarded with lies and half truths through media and friends. Unless we turn off “worldly influences” such as News, TV, Movies, etc…and seek God and His truth, we are doomed to fall away. Faith comes by hearing. What we 'hear is what we will eventually believe. As for the Word, it is a constant discipline to remain in truth. One can't expect to stay in faith just by coming forward durung an alter call, and saying a prayer. No the enemy is just outside the church doors ready to steal away the Word. Luke 11:21″When a strong man, fully armed, guards his own house, his possessions are safe. 22But when someone stronger attacks and overpowers him, he takes away the armor in which the man trusted and divides up the spoils. 23″He who is not with me is against me, and he who does not gather with me, scatters. I would bet your friend, who has declared themselves an atheist, was worn down by satan, and failed to arm themselves with truth. The world influences finally won. Will people who chose not to fellowship with Christ before death, have a second choice after death. No. >> When I experience God in a relational manner, it's easy to understand He exists and cares for me. When I stand aside and judge His motives, it's hard to understand that He could be anything other than evil. God is not evil, He is Holy. Giving up His Son, His only Son as a ransom for the whole world does not constitute evil. No, that is love. I hope you can find the time to listen to Chip's pod casts. Especially his current series. “God: As He longs for you to see Him. ” Perhaps recommend them to your friend. I am praying Col 1:9-14 for you. Didn't mean to post the same thing twice. Hope you can delete one. I might also add that 'Religion” has crept into the main stream churches and has diluted and misinformed the masses. That is why it is important for ourselves to feed our selves through prayer and meditation. Time is sometimes very hard to dedicate to our discipline. I find it easier to turn other stuff off, which reduces the counter influences. I'm sorry to hear that someone you love, who formerly professed to love Christ, is currently making “shipwreck” of his life. I will pray that things will turn around, so you both can have peace about the situation. 1) God is *not* the author of sin, but the Giver of *good* and *perfect* gifts. We live in a sin-cursed world, though. God is *able* to deliver us, just like he delivered Shadrach, Meshach, and Abenego from the fiery furnace — and probably more often than we know, He *does* deliver us. But just as they stated, he's not *obligated* to do so — sometimes, He allows things to happen — things he did not *cause* to happen. 2) Inevitably, someone will use Rom. 8:28 to suggest that there *must* be a “lesson” in what happened. But Rom. 8:29 begins with the word “For”, indicating that the thought is not finished. IMHO, the “things” in 8:28 refer to the things God did that are listed in v. 29 & v. 30: foreknew, predestinated, called, justified, glorified. 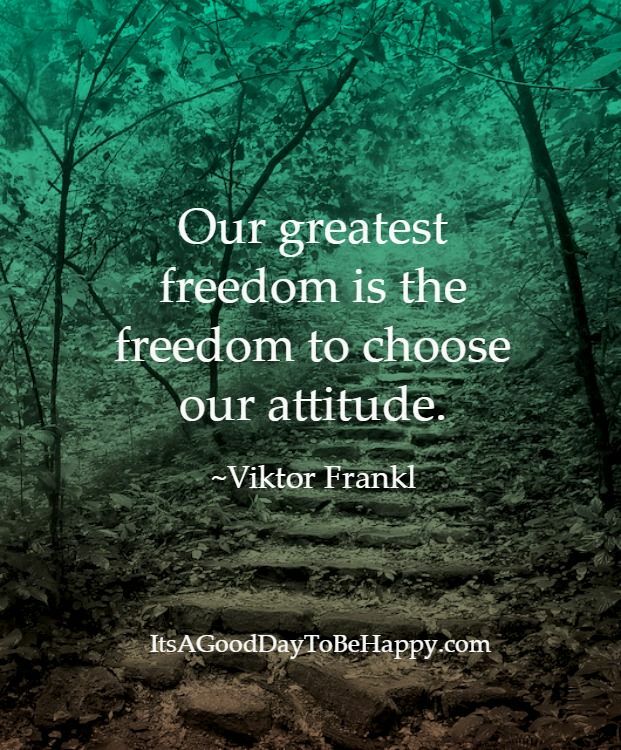 3) Speaking of “choice” — I really don't have the time or mental energy left to get into this now, but IMHO our “choices” have to do with our deliverances/blessings in this life, and this life only — not our *eternal* salvation. So IMHO, no, there isn't a “second opportunity” to make a choice, but [still IMHO] there wasn't a first one, either. Whoops — I didn't plan to compete with John for length. LOL!